When the Milwaukee Admirals signed Stephen Perfetto yesterday it raised a few questions among the readership of: what exactly does that mean and how would the lines look? Well, assuming that Frédérick Gaudreau sticks around with the Nashville Predators out of their pre-season training camp, Perfetto’s addition yesterday would mean that AHL group just received their prospective twelfth forward for the 2017-18 season. That is just enough to fulfill a complement of four forward lines. In short, there really is still much to be done to not only help the Milwaukee Admirals but the Norfolk Admirals in the ECHL. Day 3 of 2017 Nashville Predators Rookie Development Camp is one that doesn’t feature on-ice practice. That isn’t to say the group in camp aren’t getting a day-off though as today will see everyone being active in the local communities. Being a pro on the ice is one thing. Being a pro off the ice is something completely different and something far more important. That’s their plan for the day. And Day 4, tomorrow, will be back to practice sessions at Centennial Sportsplex for the final stop before the Future Stars Game held at the Bridgestone Arena Friday night. With this community day set I find it a nice time to give an analysis of some of my first impressions from the opening two days of on-ice practices. Last night’s result was one that I have been dreading for awhile now. The 2016-17 season for the Milwaukee Admirals is over. It was my fifth around the team and fourth as Editor-in-Chief of Admirals Roundtable. It feels like the more I’m around the Admirals the more playoff exits such as last night sting. And this season it especially hurt to watch it finish so fast. I said as much in today’s Chatterbox: this year’s team was a special one. While many get to view the on-ice product and talent associated on that level I’m fortunate to get to see that perspective as well as the behind the scenes views to get to know the team that little bit more. I always try to share that perspective as much as I can through interviews but lost in it can be some of the banter or other sights and sounds that come with being around a hockey team for a full-season up close. This year’s Admirals team was a favorite of mine. The people associated with the team were all such good people and being around a group so upbeat like that is infectious. What you would hope for in an AHL affiliate is to create a positive environment for all the clashing of age, talent levels, personalities, and nationalities to come together and find a level of success through it. They came together immediately. It’s something that hasn’t always been true but you could see it quickly. And it’s why there were so few bad stretches over the course of this past season. I think part of what was as crushing as being eliminated from the playoffs last night for the Admirals was realizing that group of people likely isn’t coming back next season. At first glance, there are 14 players that are at the end of their contracts with the completion of the 2016-17 season: Derek Army, Justin Florek, Frédérick Gaudreau, Jonas Gunnarsson, Mike Liambas, Marek Mazanec, Andrew O’Brien, Adam Pardy, Adam Payerl, Stephen Perfetto, Rick Pinkston, Mike Ribeiro, Mark Visentin, and Matt White. As great as it would be for those names to return the chances of so much as half of those names coming back are slim. The off-season coming up for the Nashville Predators and their AHL affiliate could very well be a busy one. Whether it be positive or negative isn’t known yet. What is known is that this year’s group was positive and deserved more than to be swept out of the playoffs. It’s sad that it ended early but those who were part of this year’s team all became better for having been part of it. For all the players who took the time out after practices and games to provide interviews here on Admirals Roundtable: thank you for doing so. For the coaching staff and more associated around the team rinkside – Dean Evason, Stan Drulia, Scott Ford, David Rook, Scott Nichol, Ryan Costello, Doug Agnew, Jason Nordby, and the Equipment Crew of Kris, Adam, and Q – thank you for your time, the banter, and the insight. Of course, thank you mentions wouldn’t be complete without mentioning the entire Milwaukee Admirals front office. This season was an adventure for the entire staff of the Admirals behind the scenes as they all embarked on this new adventure with the UW-Milwaukee Panther Arena. It was always going to start as an adventure with Year-One featuring growing pains and learning experiences that all can be improved over time. I greatly enjoyed the return to the MECCA this season. I know it will be even better over time through fan feedback and the years of improvements still to come to renovating the classic venue which immediately felt like -home- for the Admirals this season. And now to end on the personal note. I’ve had moments this season where I slipped away from the byline. There was a reason for doing that. This past season was quite possibly my last. It has been an immensely draining season for myself behind the scenes and one that has had me mentally burned out. I’ve been chasing a dream since I was 14-years old. I turn 29-years old this July and have spent the last five seasons with the Admirals living out my dream. Yet, reality has kicked the crap out of me all season long and the need of full-time work has taken over the hope for full-time work. I’ve lost the hope for full-time work. I really have. And while I’ve treated Admirals Roundtable as a full-time job for these past four seasons – it was never meant to be treated as such. If there was a happy medium? That would be great -but- I still need to detach and find it. If this season really was the last for me? It was the last season for me. I’m proud of what I’ve been able to accomplish. I can’t think of anything more I could have done or things I would do differently. I am forever grateful to everyone who I’ve come across on this journey. I have met such great people and it is those relationships that have made my pursuit of this dream of mine even more of a dream worth chasing. I suppose the end message here is that I don’t know what the future holds. Not for exactly what the Milwaukee Admirals will look like for the 2017-18 season or if myself will be there to cover it. I do know that the ride that was the 2016-17 season was a great one. I want to thank everyone for being part of it. This has been a hugely memorable one for me. And that’s courtesy of all of you. 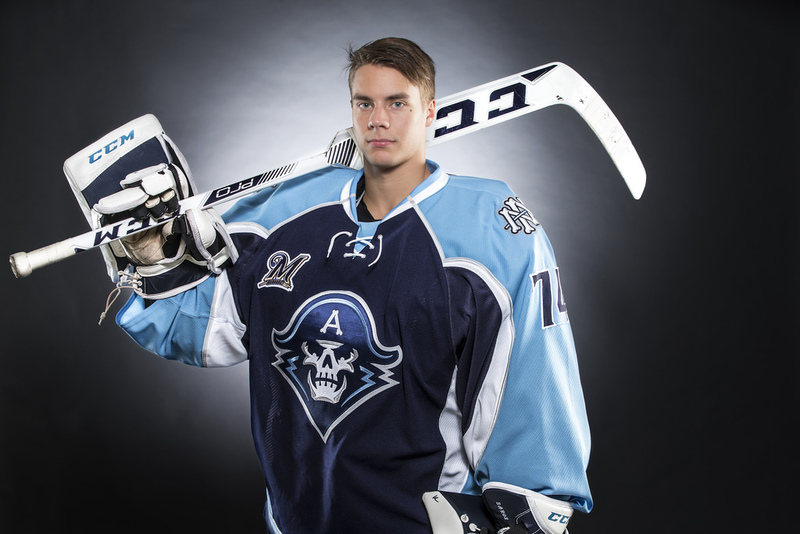 Do the Milwaukee Admirals miss the services of Pontus Åberg? No. Do the referees in charge of the series matter? No. Do the calls being made in this series go firmly against the Admirals? No. Do the Admirals trail the Grand Rapids Griffins after the first leg of the best of five series? Yes, and they are one more defeat from a third successive playoff exit by way of sweep and eleven consecutive playoff defeats. Anyone who has followed this year’s Admirals closely can say that the team is a special one. There is a great balance of quality leadership and great young talent all meshed together. When all pieces to the puzzle come together the Admirals can be a devastating team to play against through their high speed and skill level as well as being physical on defense with great goaltending to support it. The Admirals are not down 2-0 to the Griffins in this opening round best of five series because of any one specific loss of those great attributes. There have been times when Marek Mazanec has really shouldered the weight in net. There have been smart defensive reads that have been very disruptive against Griffins attacks. And the Admirals offense has shown moments where they can be relentless. Why the Admirals aren’t making a dent on the Griffins comes down to momentary lapses in all of those great attributes not coming good as well as the Admirals doing the number one thing that they couldn’t allow the Griffins to do in this series in order for them to have success. The Griffins are under the Admirals skin. With any divisional match-up there are great rivalries founded on the constant battles held throughout a season. While there is great turn-over in the AHL many divisional rivalries can really last out down to how strong the affiliate clubs are for so long. That’s what the Admirals and Griffins has been with the Nashville Predators and Detroit Red Wings both scouting, drafting, and developing so well for so long. In part, this rivalry comes mainly down to sheer dominance and having the say of who is superior. The other part comes from something the Griffins excel in: talking, talking, and more talking. Whether it be Tyler Bertuzzi, Mitch Callahan, Colin Campbell, Joe Hicketts, or Dylan McIlrath – the Griffins talk a ton after a whistle, in scrums, at face-offs, and around the bench. That nature of their team has been blatant since the 2015-16 season. It worked then. It works now. And the Admirals play up to it by disregarding what it is they do well to play into the Griffins antics. As all of the talking gets played up what the Griffins get to do is allow their skill players and veterans to dictate and pace the game. The Admirals are fighting a different battle on the ice and losing the most important one. The style in which the Griffins play, to me, is never one that will win a Calder Cup because a far more heads-up and mature team will come in, ignore the talking, and play their own game much like the Lake Erie Monsters did a season ago. The Admirals need to be that team. But they aren’t right now. They are letting the Griffins pull their strings time and time again. The great news that shouldn’t be lost one bit by how the first two games of the series played out is this: the Admirals host Game 3 on Wednesday night at 7:00 PM CDT. This series isn’t over. The Admirals are still as special of a team as everyone knows that they are and can be. They just need to smooth out a few areas of their game and -most importantly- kill the talking with deafening silence. The Admirals chirp back at the Griffins banter needs to be voiced by the scoreboard and the fans at the UW-Milwaukee Panther Arena. For the Admirals to put everything together and take Game 3 provides them the exact same atmosphere, ability, and opportunity in Game 4 on home ice. That is when this series sees pressure sway but that can only truly happen if the Admirals let go of the talking, let go of the post-whistle run ins, and stick to their strengths. The Admirals are still alive in this series. It is on them to keep it that way on Wednesday night. The Milwaukee Admirals and Grand Rapids Griffins are very similar teams that always seem to push each other hard. That remained true last night with Game 1 of their opening round playoff series needing overtime. The Griffins would win 4-3 on the night to take a 1-0 lead in the best of five series but there is still plenty to like from what the Admirals did to start the 2017 AHL Calder Cup Playoffs. When last night’s game was played at five-on-five it was hard to not like the work rate that the Admirals were delivering against the Griffins. It felt like that was a small rarity in the game when both sides weren’t working a power-play or penalty kill but the Admirals rolling their lines looked to hold their own alongside the Griffins. The Admirals defense in particular was very good and forced most shots from out wide. The area that the Admirals will want to be aware of, should they continue forcing wide shots, is that the Griffins were smart enough to start putting low shots to the net and fighting for second and third chance opportunities around the net. It generated the best and most successful chaos for the Griffins offense and its on the Admirals to not only defend wide but at their net to clear out both sight lines and the rebound chances the Griffins are looking for. If we could go back to the penalties for a moment. I’d be shocked if either team liked their games last night almost purely because of the amount of penalty troubles both put themselves into. It didn’t entirely make and break moments in the game – but it really could have should one of those power-plays uncorked more to the net and made the goaltenders work even harder. For the Admirals to give the AHL’s top power-play seven chances is a recipe for disaster. They need to play smart and keep the game at five-on-five. Yes, it might hurt not having the Admirals top player in Pontus Åberg around for the Calder Cup Playoffs. I get that. However, Åberg 100% deserves to be where he is now competing in the Stanley Cup Playoffs. Plus, that absence for the Admirals creates competition and forces everyone else on the team to step their game up. The man to do just that last night was the forward scoring step-for-step with Åberg at the end of the regular season, Frédérick Gaudreau. Since Åberg’s recall to the Nashville Predators his spot on the left wing of the Admirals top power-play unit has been given to Gaudreau with Justin Kirkland slotting in as the net front presence where Gaudreau was. It took the Admirals four seconds of their second power-play opportunity last night to get a Trevor Smith face-off win back to Alex Carrier and a pass off left wing for Gaudreau to swat like a guided missile past Jared Coreau. The next two goals that the Admirals scored were great examples of Gaudreau’s best attributes: speed, intelligence, and skill. His ability to skate is fantastic and it put him in positions to fly on both the rush and breakaway for those two goals but what I appreciate so much is him knowing that he had numbers with him to pick out Petter Granberg and also the quickness in reading Joe Hicketts to blaze out from defending on a penalty kill to a shorthanded breakaway. He had the slick skill to get a pass to the tape of Granberg and beat Coreau on his breakaway. Gaudreau had a fantastic night and, rightfully so despite the loss for the Admirals, was named the last night’s First Star. And, for perspective sake, the Admirals scoring three goals in a playoff game last night was the most that they have scored since 5/8/11 when the Admirals defeated the Houston Aeros 5-4 in overtime. The players who scored points on the opening goal of that game were Ryan Ellis (goal), Roman Josi (primary assist), and Ryan Thang (secondary assist). Continuing perspective: Gaudreau scoring three points last night meant that he has already scored more points than anyone in last year’s playoff series against the Griffins by two points. Plus, Gaudreau matched the Admirals playoff leading scorer in 2014’s playoff run Bryan Rodney and surpassed 2013’s playoff leading scorer for the Admirals Zach Hamill who played in four games. And Gaudreau also matched 2012’s leading playoff scorer for the Admirals Kyle Wilson. You must go back to that 2011 AHL Calder Cup Playoffs that saw multiple Admirals scoring more than just three points in the playoffs with the help of having a long run. Speaking of long runs. This streak that the Admirals have going on right now is a sad one. The last time the Admirals won a playoff game was during the 2013 AHL Calder Cup Playoffs and they accomplished that during Game 2 on 4/27/13 in a 2-0 shutout victory over the Texas Stars. They have now lost every playoff game since which includes being swept out of their previous two playoff entries in 2014 and 2016. The Admirals have lost nine consecutive playoff games. During this run the Admirals have been outscored 30-11 and shutout twice. You have to go back to just prior to the Admirals last playoff win, Game 1 of their 2013 series against the Stars, to find the last time they were in an overtime game. This run has all come during the reign of Dean Evason as head coach of the Admirals. And that is unfortunate because I know how well respected by the players that he is and you can look no further than the Predators roster right now and see how his influence with the Admirals is so positive. The Admirals playoff winless drought, for me, is one of sheer frustration. Many of the games slapped down in the losing streak haven’t been that bad or sloppy. There have been some rough ones, no doubt about that, but last night’s effort just wasn’t one of them. The Admirals last night showed some of the best fight and competitiveness that the Admirals have produced in the Calder Cup Playoffs in quite some time. There was a spark there that just didn’t ignite into an inferno. And both teams can say that. There is still much to be done in this series. Neither the Admirals nor Griffins played to the best of their ability. Eventually that quality will shine through from one or both teams before this series is done. Game 1 simply planted the groundwork. Now it’s down to who can execute the best from this point forward that really decides the series. How will Game 2 of this series for the Milwaukee Admirals be different? Do you feel that the Admirals are capable of taking a game in Grand Rapids and, at this stage, would you consider it highly important that they do so rather than having a possible Game 5 at the Van Andel Arena? After an energy sapping three-in-three the Milwaukee Admirals have earned a day-off of work. They should be returning to practice tomorrow as they prepare for a Thursday and Friday road set up North against the Manitoba Moose. This break in the action allows for a nice time for you readers to chime in and ask away questions that you have across the board. Let’s get a proper Admirals Roundtable Mailbag started, shall we? I actually didn’t meet a big name hockey player until I started up as an intern with the Milwaukee Admirals. So, you’d be going down the list of the players from the 2012-13 season plus many of the names included on the 35th Anniversary campaign that cropped up. Pekka Rinne comes to mind there. What I often enjoy though is that you really can’t get star struck with hockey players. They’re just too down to Earth to get that feeling. I would counter by saying I met Al Unser Jr. when I was four-years old at Road America and he brought me under the roped off section of the Galles Racing garage to show me his car and sign me shirt. I seriously still remember that one. My favorite hockey moment would probably be watching the Colorado Avalanche and Detroit Red Wings rivalry growing up. That’s probably what really had me locked into hockey from that point forward. Even looking back now that rivalry holds up because it crammed so much: intensity, high level talent, best teams in the Western Conference at the time, and usually Stanley Cup implications off of it. The brawls were a blast watching it when I was younger. The talented players around it are what make it hold up for me. My favorite non-hockey moment would have to be school related. As a freshman in high school I was so caught up in the “what will I be doing for a career and when I get to college” dynamic so much that I was never really in the present. I ended up getting a 1.5 GPA and was basically on the verge of getting kicked out of school at 14-years old. I would say the two memories that come to mind the most are when I first made Honor Roll two-years after that happened or either my high school or college graduation. At the time of making Honor Roll I needed to go around and have professors sign off a check list every now and then to get repeated updates on the work I was doing – probably to keep me fully aware on grades. The last class I had to check off the professor pulled me aside after class to tell me I made Honor Roll and it meant the world knowing I had worked back out of re-doing all of my freshman year classes in tandem with sophomore classes at Walden III. I’d say that’s where the work ethic started and every accomplishment since probably starts from that moment. What made me get into hockey was the sports field in general. I always loved the sport but, at the University of Wisconsin-Parkside, all I really covered was Women’s Soccer and Women’s Basketball. I had applied several places to try and break into the job field and ended up -probably- becoming the oldest intern that the Milwaukee Admirals ever brought in. I’ve been caught on working in hockey ever since. My biggest influence would be my parents. They’ve taught me everything as far as selflessness, work, and having good humor goes! My most painful memory – going the two route as I often catch players with that. Injury-wise, I’ve been fairly fortunate to not have had any broken bones but I did tear my right ACL a few years back and not long after that I had a left high-ankle sprain. I would say I still feel the right knee being weird at times but the most painful was the ankle. When your knee goes it is more of a jolt, you hear it pop in your ear, and not much more than adrenaline after. The ankle hurt but, with college starting the week after, I bucked the brace – taped it myself zombie apocalypse style – and walked through the pain. Non-Injury, the most painful memory for me feels like it is on the horizon in the near future as it relates to work. Behind the scenes this season it hasn’t been great but, as with the players in the AHL, I’m going through the developmental process in my own way. I’ll always be a believer in good things happen to good people. No matter what lies ahead I’m sticking to that. Cody Bass is done for the season after suffering a knee injury on 12/28/16 in a game against the Iowa Wild. He required surgery and is in the rehab process as we speak. The last I checked he no longer needed crutches and is slowly getting back in the swing of things which I’m sure is a well needed mental boost. As rough as this season is, especially given his rise back to NHL caliber play since joining the Nashville Predators organization, he is still under contract next season and will likely be a top candidate as Admirals team captain for the 2017-18 season. He’s a real well respected locker room presence and none of that goes away after a season ending injury. Well, in order to help facilitate that Dante Fabbro would need to sign his entry level contract with the Nashville Predators. That hasn’t happened yet. The players on the Milwaukee Admirals radar at the end of this season are: Frédéric Allard, Samuel Girard, and Yakov Trenin. Though, we aren’t short of a surprise here and there as several college and junior seasons are coming to an end which sees the likes of -say- a Tyler Kelleher turning up out of nowhere. Why, Roscoe is an orange sea dog with a puck for a nose! I actually had this question brought up when both myself and Roscoe were in Nashville. I thought a fan on Twitter had a newspaper clipping that had a bit of backstory to Roscoe but I can’t seem to find it. I’m not sure there is any exact league-wide number to that but I can say every PTO Contract serves as an audition for many players in the ECHL to make a claim to be full-time in the AHL. People may already forget that Adam Payerl started last season signed to the Cyclones in the ECHL, was a roster invitee to training camp, and started last season on a PTO before earning an AHL deal with the Admirals and then an NHL deal with the Predators. Matt White was a PTO signing last year from outside of the organization with the Manchester Monarchs (ECHL) who signed a two-year AHL Contract with the Admirals. Derek Army this season is on his second PTO deal with the Admirals and it wouldn’t surprise me to see that lead to something more next season. I would expect him to go to Toronto or Boston, then Buffalo, and then to the New York Rangers (I kid, I kid). Tyler Moy still hasn’t been signed to any sort of contract by the Nashville Predators so he really can’t do that yet. I would greatly hope that he does sign and begins his pro career next season as a member of the Admirals, though. He has had a fantastic 2016-17 season with Harvard and I would be gutted if he made like his ol’ teammate Jimmy Vesey and darted. I don’t know if you would see the Predators draft a Harvard talent ever again. That mostly extends across the full organization but you can give plenty of credit to how the Admirals setup shop to Nashville Predators Assistant General Manager and Milwaukee Admirals General Manager Paul Fenton and his scouting staff. As a small example, if you go back to hear the post-game audio when Stephen Perfetto signed Dean Evason was quick to praise them specifically for finding him for the work he was doing for the Alaska Aces in the ECHL. More often than not the praise can go out to Fenton for what Admirals fans get to see as far as non-drafted talent goes. I would certainly love to see more variety back on the schedule. There were quite a few Eastern Conference teams that were always a lot of fun to see appear on the calendar. The Toronto Marlies and Rochester Americans come to mind as teams that were fun going back and forth with. Even the brief time against the Utica Comets and seeing games played inside the Utica Memorial Auditorium where scenes from Slap Shot were filmed was awesome. I don’t know if that would ever happen if there were to be a return to a full 76-game schedule for all AHL teams. It still is asinine for the AHL to allow for a lesser schedule for Californian teams. If cutting excess travel out of the equation is the goal the Admirals traveling from Milwaukee to Iowa to Milwaukee in three days doesn’t paint a fair image nor does travel expense from teams purchased by NHL parent clubs to be closer to home. If there are any teams that should cover the cost of excessive travel – it’s them. Do you have any additional questions? Feel free to ask away in the comment section below and I will add them to the Mailbag up top with my answer. Tomorrow we will have a story on the Cincinnati Cyclones with Sin Bin Cyclones own Dakota Johnson. Keep tuned as we await the Manitoba road trip! It was the second period the Nashville Predators against the Calgary Flames when news broke of a trade. The Predators traded Max Görtz to the Anaheim Ducks in exchange for Andrew O’Brien. While this news raised a few eyebrows because of the teams involved in making the trade this was very much an AHL trade. The initial question one would ask is the simple one: why? The short and sweet answer to this trade coming to be is the injury status of defenseman Adam Pardy. During Wednesday night’s game the veteran was trekking back in his own half when Patrick Brown of the Charlotte Checkers jammed his stick into the braking skate of Pardy as the two were racing towards the end wall. Pardy went down hard into the boards head and left side of the body first in a violent collision. Brown received a tripping minor on the play while Pardy left the ice after getting looked on and helped off the ice by head athletic trainer Doug Agnew. He would not return for the rest of the game. It appears that the extent of the injury to Pardy was bad enough to force a trade within twenty-four hours of him going down. He is out indefinitely and joins the likes of Cody Bass (lower-body) and Miikka Salomäki (lower-body) in that respect. Where losing Pardy hurts the most is up for debate. He was a tremendous veteran style defenseman that was doing great work with the Milwaukee Admirals since he was acquired in an AHL trade earlier in the season from the Springfield Falcons. He brought great depth to the team and filled a role that the team quickly lost when Matt Irwin made his claim to being with the Predators for the rest of the season. The other area where losing Pardy hurts next is that his veteran résumé also meant being a great depth option for the Predators to recall in moments of need – something that seemingly has happened far too often already this season. Pardy has been tasked to play four games this season with the Predators. Not too shabby for a guy that lost out on an NHL contract with the Florida Panthers in their pre-season camp, accepted an AHL deal, was traded to a new AHL team, and worked to earn the NHL contract from the Predators. With all of that in mind the next question to me is the one that makes yesterday’s trade hard to understand. Did the Predators actually find a suitable replacement for Pardy with O’Brien? And the answer to that is an emphatic and capitalized NO. O’Brien is 24-years old and was drafted by the Ducks in the fourth round of the 2012 NHL Draft. He turned pro in the 2013-14 season where he split time between the Norfolk Admirals (AHL) and Utah Grizzlies (ECHL). That first pro season he saw the ice only 28 times and was in the ECHL for 24 games of that season. His last two seasons have seen him stay on the ice to a much higher degree and with only a single ECHL appearance: 28 points (10 goals, 18 assists) in 121 games with 174 penalty minutes and a plus/minus rating of -13. This season he has played 10 games from the San Diego Gulls 32 games played and has 2 assists, 4 penalty minutes, and a plus/minus rating of -2. He has never played in the NHL. What I see here then is that the Predators traded away a struggling prospect in Görtz for a struggling prospect in O’Brien. The difference is that at least Görtz in one previous pro season displayed excellent skill and is a forward capable of wracking up lots of points – he was the Admirals second leading scorer in his North American debut season a year ago with 47 points (18 goals, 29 assists) in 72 games. O’Brien has yet to do much of anything and, between his first pro season and current season, is struggling to even make the ice. If the Predators wanted to replace Pardy and were willing to trade a prospect away within their own conference there were better options available to them to fill a veteran defensive void: Jamie McBain and Zbynek Michalek (Arizona/Tucson), Mark Fraser (Edmonton/Bakersfield), Chris Butler (St. Louis/Chicago), Maxime Fortunus and Mike Weber (Minnesota/Iowa), Brian Strait (Winnipeg/Manitoba), Vincent LoVerde and Zach Trotman (Los Angeles/Ontario), Cameron Schilling (Chicago/Rockford), Andrew Bodnarchuk (Dallas/Texas), and -even on the very team that they traded with- Nate Guenin and Jeff Schultz (Anaheim/San Diego). Those were all equivalent or like-minded players that could fill into Pardy’s NHL/AHL veteran depth role and the opted to trade a prospect that showed great promise a year ago for none of those names and a player that features no veteran-like traits that could serve the Predators -and possibly even the Admirals- well for the length of the season. For the Admirals and O’Brien’s skate – I really hope I am massively wrong and the Predators get away with a solid talent heist. I just don’t see how it fits the criteria of what they were looking to fill for both the Predators and Admirals. The Admirals right now have someone who is doing what O’Brien has doing in his career and they picked him up on a PTO Contract from the Manchester Monarchs, Rick Pinkston. Is that equal value to Görtz’s potential or Pardy’s capacity to work between the NHL/AHL? No. This feels like a knee jerk reaction made in the space of a day to fix a problem with something that could quickly become a new problem. Görtz’s struggles this season should not have made him fodder for such a woeful return. Everything from this point forward is dependent really on O’Brien being superior to the likes of a Pinkston or Jonathan Diaby. It should also get a serious nudge-nudge for Jimmy Oligny to get the NHL contract that the Predators should have given him after last season. Ideally, P.K. Subban and Roman Josi get back for the Predators soon enough for Alex Carrier to make a return to the Admirals. Even more ideally the injury bug plaguing the Predators’ 2016-17 season goes away and never comes back. Petter Granberg would have been nice depth awaiting a chance to go back up after a good AHL run but even that isn’t attainable because in the moment he gets to the Admirals he gets recalled and hurt. I do not remember the depth ever being so tested in my time following the Admirals these past five seasons. There are so many question marks that hang over the Predators and therefore their minor league affiliates. The biggest of which, if this injury bug continues, is what happens at the NHL Trade Deadline? Trades are already happening now. They might feel minor on the Nashville scale but the repercussions in Milwaukee have been painful. Are bits and pieces going to be sold off to salvage a season or will everyone stand pat if returning healthy bodies act as newly acquired pieces? The past few weeks from an Admirals perspective has felt a lot like having a dark cloud hovering over the entire group. That cloud could be growing in the weeks to come. What is your reaction to Max Görtz for Andrew O’Brien? Did the Nashville Predators get equal value for Görtz? Did the Predators really fill the void left from an injured Adam Pardy? Will this chain of moves for the Predators that are impacting the Admirals ratchet up come the NHL Trade Deadline? It caused a slight double-take on my part when the Nashville Predators reassigned Kevin Fiala to the Milwaukee Admirals on Tuesday morning. He had been performing really well at the NHL level this season and is beginning to show flashes of his capabilities on the grand stage. That there is the problem though. They’re only flashes and you hope for consistency. That’s when it is time for the AHL to become involved to let prospects going through the motions, slight as they might be, a chance to play maximum minutes and get a full head of steam en route to the NHL spotlight once again. Fiala endured a day of travel that saw him journey from Vancouver to Minneapolis to Charlotte when he was reassigned from the Predators to the Admirals. He made it in time to play Tuesday night and he didn’t look like someone who had woke up at 4 AM and traveled for ten hours when he was on the ice. He was sensational. He followed that up with a repeated quality effort that was sealed with one of the prettiest worked solo goals of the AHL season to secure the win for the Admirals in overtime. He was with the Admirals for barely two days, played two games, and looked like someone that was head and shoulders above so many outstanding players who were on the ice. He was skating with pace, he was active off the puck and being attentive to defensive assignments, and was buzzing around and creating offensively at a time when the Admirals desperately needed an igniter in that department. Why is Fiala with the Admirals right now? Why is Fiala not doing what he just did in Charlotte against NHL opposition on a shift-by-shift basis? And is the Fiala who has had those flashes in the NHL just who he is always going to be? Those seem to be questions on tons of peoples minds as comments floated on in after he scored last night’s game-winning goal in overtime. “We lost a one goal game to the Canucks Tuesday night and here is Fiala scoring a game-winning goal in overtime when we need him.” Those sorts of commentary chirps were raining in. Listen folks. I understand the frustrations. I understand the magnitude of a first round selection’s potential to perform. But, Fiala’s current spot that he finds himself in – whether temporary or longer, I think that the expectations weighted on him have been blown way out of proportion. It’s time to stop thinking about what Kevin Fiala isn’t and start appreciating Kevin Fiala for who he is. Fiala is still 20-years old and has taken great leaps forward this season for both on and off-ice approaches to the game. If expectations are “necessary” for a first round draft choice I kindly point people toward the season that Austin Watson is finally having in the NHL and the long path it took for him to get there – at now 25-years old. People can be foaming at the mouth for Viktor Arvidsson now but he is the player that he is by comparison to someone such as Fiala because he is three-years older and has played 115 games of pro level experience more. The polish to Arvidsson’s game and maturity come largely because of that experience. During the 2013-14 season the Admirals had contributions for 47 games from a 19-year old named Filip Forsberg. He was placed in the AHL on the basis of sharpening his attention to detail and finding consistency in his all-around play. There was optimism that Fiala’s “Forsberg Year” was the 2015-16 season that saw him dip a toe in the NHL for 5 games but stuck around in the AHL for the season and was the Admirals leading scorer – as a teenager. Of the Admirals roster throughout the whole of this current season there are only three players to have played that are younger than Fiala: Anthony Richard, Alex Carrier, and Vladislav Kamenev. Only one of those names was a full-time pro a season ago and the other two are just beginning their pro careers this season. In different circumstances Fiala is a first-year pro this or last season. He is then massively ahead of the curve as far as his developmental process goes for a 20-year old. Yet, do not let that fact detract from the very real nature that he is still a prospect destined for some speed bumps along the way. The Fiala that I’ve had the opportunity to observe this season with the Predators is largely different than his past self. He is starting to fill into his frame as the kid becomes more of a man. Him getting stronger is allowing him to feel more comfortable getting into dirty areas as well as finding better success in those key places on the ice. Having talked to him during the Summer and in his brief time in Milwaukee this season – I’m talking to a different person than when he first arrived. He is by far and away more comfortable in his own skin in the North American environment than when he first showed up and he is also getting a far greater understanding of the different style game that this region of the world plays. He’s matured off the ice. Last season went a long way into seeing that become reality. He isn’t looking to shoot himself in the foot or be down on himself. That same treatment is given to his play where he seems to be far less recklessness the way he plays and he is starting to make savvy reads on both offense and defense. That’s not to say there aren’t some bad turnovers that he makes from time to time or even offensive plays that he could bury – that he doesn’t. This is the breaking point that can get him pushed down the lineup or flat out healthy scratched. As the Predators begin to assemble a more layered approach to the way they attack a game these days, with more veteran minded or scrappy players like the line of Cody McLeod–Derek Grant–Harry Zolnierczyk, it makes having the risk-reward element of Fiala one that isn’t as tempting to go to at the moment. So, if you’re not playing him or don’t have intent to, why leave him in the cold when at 20-years of age he should be playing, developing, learning, and proving the Predators wrong in their decision to send him down. You should want a level of fire in Fiala’s game, shift-by-shift, and game-by-game. That is the exact result the Predators would have wanted. And it is the exact result they received in two games played for the Admirals on the road in Charlotte. The path of getting to the NHL takes so many different forms. Frédérick Gaudreau and Mike Liambas were amazing stories for their long roads to Nashville. Others, even if a bit more direct like a 2015 NHL Draft selection such as Alex Carrier, can still be surprising given how fast they can push for the opportunity. Fiala didn’t get to the NHL too fast. He isn’t getting there consistently too slow. He’s just learning like the Forsberg, Watson, and the Anthony Bitetto‘s of the world before him. Right now the Predators are allowing Fiala the freedom to learn in far greater capacity at the AHL level, for however long it might be, than they feel they have the flexibility to do now in the NHL. That shouldn’t be viewed as a negative of the Predators. And it certainly shouldn’t be viewed as a poor reflection of Fiala. This morning’s news that the Nashville Predators acquired Cody McLeod from the Colorado Avalanche in exchange for Félix Girard was a bit out of left field. Yes, we’re slowly creeping towards what should be an intriguing NHL Trade Deadline in a month and a half. Things like this are going to rumble along on that day. Yet, as far as trades go, this feels like the Predators are reaching for answers and hoping that something sticks. To understand this trade I feel like there are really about three avenues that need to be explored: last off-season, Cody Bass being injured at the end of December, and last night’s Predators game against the Boston Bruins. Let’s start by asking the question: what type of team are the Nashville Predators? If you were to have watched them last season, or in the past, you would say that they are a quick team with some excellent skill players but have stellar defensemen and a high caliber goaltender. If you were to have watched them last night – you’re probably looking at today’s trade and simply agreeing with it. That game was a heavy -heavy- style contest. It nearly had a playoff feel about it and was surprisingly heated given how it isn’t like the Predators and the Bruins play all the time. The game was very defensive for the Predators. They weren’t rolling offensively and leaned a lot on Juuse Saros and getting shots blocked in front of him to steer clear of danger. Another key element to last night’s Predators game was seeing Roman Josi get checked towards the head by Anton Blidh which resulted in a five-minute major for interference. Blidh wouldn’t be answering in the fight department for the occasion. Instead all inquiries were redirected to Adam McQuaid. Newly acquired from waivers Derek Grant decides to make a big first impression and instead took a few impressions and an upper-body injury. What was happening in Colorado not far removed from that? Why, McLeod face-punching Joseph Cramarossa of course. That fight came after a big neutral zone hit by McLeod which caught the eye of Cramarossa. It appeared after the fact that McLeod was more game for a scrap after the hit than Cramarossa. And that sort of played out in the fight itself, too. Now, about how last off-season plays into moments such as last night’s Predators game. You know how Blidh didn’t fight but McQuaid did? You know how McQuaid is a heavyweight when it comes to his HockeyFights résumé? Well, in instances where a player the level and importance as a Josi goes down from a hit like that – who do the Predators have to act such as a McQuaid? Because they did have one and he just so happened to be the defensive partner of Josi and team captain. When the Predators did trade Shea Weber they did get a superstar level talent in P.K. Subban. It is in no way fair to judge this trade now and it will be a good few years before you can actually take into account just how both organizations did from swapping two of their best players for one another. But, what Subban never had in him was a presence on the ice of intimidation. If Weber were paired with Josi last night I question not only if Blidh gets away from that check to Josi without a fight – I question whether he thinks to deliver that check in the first place. The Predators don’t have that presence anymore. They need a little bit of bite to them. So, who do they have? The Predators have sixteen fighting majors this season. And, while I would still argue that the day and age of the enforcer is gone, that still gives an indication of times when the game simply dictates a response or action. Who leads the Predators in fighting majors this season? Austin Watson with six fights. He is followed by Bass with three fights. Mike Fisher has two fights. And then five other players have dropped the gloves a single time. Watson, as much as I love this soundbite of Magnus Hellberg – who at the time was saying that sarcastically because Watson had just delivered his second career pro fight, was not the choice to match-up with McQuaid. Who is to say Watson wouldn’t have suffered the same fate that Grant did? And, if so, who is there to make the crucial blocked shot late last night in the closing seconds of a 2-1 game? You would assume then that having a guy like Bass around is then the next step. But he isn’t available. Bass went down on 12/28/16 after clashing legs with a member of the Iowa Wild near the Admirals bench. He needed help to get off the ice and down the tunnel to the Admirals locker room. He has since had an MRI to diagnose the full extent of his injury, which hasn’t been revealed in detail at this moment, and has missed the Admirals last six games. He is considered out long-term. There is no presence on the ice then for the Predators for moments such as last night. Players who could do the job aren’t suitable for it. And the one that is isn’t available and was earlier in the season someone they tested to waivers anyways. This is where today’s trade comes in. Again, I feel most Predators fans likely view last night’s game and the player they just received and see that as a quick fix to a needed role for no cost at all because Girard never played in the NHL anyways. I see the merit of what a McLeod can bring to the Predators. There is a role there that can be filled. I can also hope that McLeod coming to a new setting can provide some life into his game that he clearly wasn’t getting as part of a struggling Avalanche group this season. What’s wrong with this move is that it punches a hole in your AHL affiliate by trading away its heart and soul type of player for someone whose career accomplishment to this point was leading the NHL in fighting majors last season. McLeod is 32-years old. He has been a well respected locker room presence for the Avalanche and served as an alternate captain for five of his ten seasons with the organization. That says a tremendous amount about the character he can provide to a team. I’m not questioning that one bit. What I do question is the amount it took to acquire the struggling and aging forward from the Avalanche. Girard is 22-years old. He has been with the Admirals in the AHL since his junior playing career came to an end. He was a captain of Baie-Comeau in the QMJHL his last two years in junior and has worn an alternate captain “A” on the front of his Admirals jersey numerous times over the course of his 172 games played for the team. While stats might not shine for Girard that by no means degrades what he is doing on the ice. Girard has been the best face-off man that I’ve covered in the AHL since starting out in 2012-13. That same level of care and attention to detail in the face-off circle he provides to his teammates, such as Vladislav Kamenev – an aspiring top center for the Predators. He is a first choice option for the penalty kill and last season, because of his face-off work, started getting pushed to the power-play. Girard is, and has been since his arrival when he scored on his pro debut, a relentless on and off ice worker. The sort of player that genuinely makes a team and his teammates better. At the heart of the Admirals locker room is the group known as the “French Fries” which features Girard as well as Jimmy Oligny, Frédérick Gaudreau, Jonathan Diaby and first year pros Alex Carrier and Anthony Richard. Oligny might be the dad of that group but Girard is very much the ringleader. What this move does on what feels like a microscopic level to the Predators feels like an atomic bomb to that group – and therefore the Admirals as a whole. The Admirals started the season with a thunderous bang by going 12-2-2-1 all the way through the month of November. Then injuries started to plague the Predators. The Admirals defense was rattled and shifted up, down, and around. Recently, this same level of fluctuation has hit the forward group. From the start of December to today the Admirals have gone just 8-9-0-1 and have scored only two goals from their last 189:43 of ice time over their last four games. Tonight the Admirals face the Grand Rapids Griffins who aren’t just leading the Central Division but the entire Western Conference. If there were ever a game for the Admirals to get KO’d stiff on the ice – it would be tonight. Their top defenseman, Carrier, is up. Their spark plug forwards, Harry Zolnierczyk and Pontus Åberg, are up. And now they have just effectively had their heart ripped out to bring in an NHL player who has more fighting majors these last two seasons than points. Did the Predators fill a role today? Yes. Does the role that the Predators filled today still have a legitimate place in the current NHL game? Sure, but it should never have cost what it just cost the Predators to acquire it. What is your initial reaction to today’s trade by the Nashville Predators? Is this a move that they needed to make? Did they give up too much or is this a set-up trade for something bigger in the weeks ahead? Your Questions. My Answers. Let’s go through some mail, shall we? It’s been awhile since we’ve had a good mailbag column here at Admirals Roundtable. And, seeing as the Milwaukee Admirals are on a bit of a break from game action before packing up and getting a four game road trip started, I think the time to open the mailbag back up is now. I think it is the variety of skill sets that everyone has that ends up making the strongest team. That diversity in a group is key. With how the game is being played today though I think that speed and two-way ability across the ice is one of the most important things to really making it from one level to the next. Filip Forsberg spent 47 games and the playoffs with the Admirals during the 2013-14 season essentially to find consistency in his two-way ability – especially making sure he has detail to his defending. Look who he was then, look at what that time and learning did for him, and look at the confidence in all-around ability he now shows. So, you’re right. It is a mixed bag of tricks that all are needed. In that I suppose, at the AHL level, it is finding consistency in those skill sets and consistency over time: shift by shift, game by game, etc. My favorite goal celebration of this season so far was captured brilliantly by photographer Sara Stathas on the Admirals first school day game of the season. When Alex Carrier scored the game-winner in overtime you just see the genuine shock and joy. After that game when I spoke with him he had said that he didn’t even know the shot went in until the crowd erupted. That game already had so much electricity. It was an Amtrak Rivalry game. There were some ups and downs to the game itself. And throughout it all you had that noisy school crowd packing in UW-Milwaukee Panther Arena. Once that goal was scored the building roared and Carrier’s celly mirrored the elation of the moment. Loved it. The best goal that I’ve seen scored this season, truthfully, probably that exact same moment: Carrier’s game winning overtime goal (video). The Admirals haven’t quite had highlight reel level goals yet this season. The talent is there for them. They’ve just had some straight forward or gritty goals to this point. I did love the recent howitzer goal by Trevor Murphy. But the speed, toe-drag, and release on Carrier’s goal against the Wolves to win it in OT was pretty spectacular. It was only two games but I do think there is something to be said -even then- about Anthony Richard getting to play more with the Cincinnati Cyclones. He has a ton of speed and skill. It just hasn’t all clicked just yet at the AHL level and it has him a bit down on a very stacked totem pole is all. That said, a player has to play games – especially so young in their development becoming a pro. To go from limited minutes in the AHL to top line sort of minutes in the ECHL is just the sort of thing to re-energize a player and give them the boost and confidence they need when they get the recall back. Carrier scored a goal and an assist in his first ECHL game, both firsts in his pro career, and he has looked a touch sharper since. Both he and Justin Kirkland were great scorers in juniors. Once they produce for the Admirals I think it can let them drop the shoulders a bit more and just start working harder and let the game come more naturally. Pressure to match what was at the junior level instantly at the pro level does happen. These are two really skilled players, though. They’re just settling in. Oh, dear. The “Juuse Saros or Marek Mazanec” question is becoming the new “when can we have Kevin Fiala” question… which was the new “is Forsberg ready yet” question. For those wondering, Mazanec is the man for the back-up job this season and he is because he not only was the more affordable option on an open market but he also put service time in developmental to earn the spot. There is something to be said and to be proud of about promoting players such as Mazanec from within. His lone issue so far this season has been his inconsistency which I think just so happens to coincide with the fact that he also happens to play inconsistently in net. Would it have made more sense for the Predators to go and get a veteran goaltender to serve as back-up to Rinne this season? Possibly, but there is a cost to doing that and it was one that the Predators felt better to just give Mazanec his due all while not paying a premium for someone who won’t see much action. This scenario could change right in the middle of this current season or for next season if the Predators view it to be such an issue. Again, I think ideally Saros should be playing a workhorse role for the Admirals this season to gain what the experience of being first-choice goalie in North America is like. Instead, it is all incredibly up in the air. It’s workable in the short term as Saros gets a glance at life in the NHL, practicing with NHL talent, and learning from watching Rinne from afar. Mazanec gets to log games for the Admirals and get back in form. I just don’t think this helps anyone in the long term. Inconsistency breeds inconsistency. The response I’ve gathered from the players is universally positive. That comes from those who experienced life at the BLO Harris Bradley Center or some of those experiencing the AHL for the first go-round this season at the UW-Milwaukee Panther Arena. It is an Arena with such a great history about it. There is a character and a charm about it. And, above all, the Admirals really can call this there home and have probably practiced at the building more this season -already- than all of last season by a good margin. It makes for such a better comfort level. The locker room facilities being as nice as they are encourage players to show up early and stick around later to just hang out – which creates a positive working atmosphere and stronger team bond. Then, come game time, the fans are piled on the action that much more and the roof is lower. The buzz and noise going on during a game has just been amplified. It’s just another thing the players notice and appreciate. This is one of the first things I caught this season. While I can’t definitively say why it was the case, after a season in which the Milwaukee Brewers more current logo was in use, I do think it is a case of the Brewers moving towards that logo. It isn’t just the ol’ retro ball and glove it is the alternate version introduced at Spring Training last season that stuck around as an alternate. It’s not only now on the Admirals uniforms but the Brewers advertising banners on the boards around the rink, as well. I’m not sure if that is a sign of an upcoming full change in the near future or simply a direction they wanted to go with on the Admirals side of things. My guess is they have a minor rebranding in the works. Have further questions? Ask away and I shall update this story with your question and a response.